For the selective gardener desiring to enrich their soils without altering their constitution. Selectively harvested from the best of what the Skies, Oceans and Land provide, our nature based line promotes the most fertile soils without the use of petroleum-based chemicals. Formulated with both Seabird and Bat guanos to promote vigorous vegetative growth while using the best of what nature has to offer. 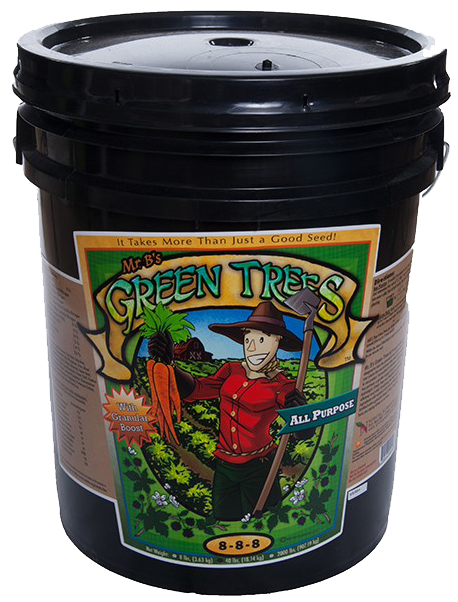 Fortified with natural minerals including Langbeinite, Azomite, Greensand and Lime, micronutrients are in harmony with macronutrients allowing your plants to thrive. New Planting: It couldn’t be easier to use Green Trees. Just remember the rule of 1:1. 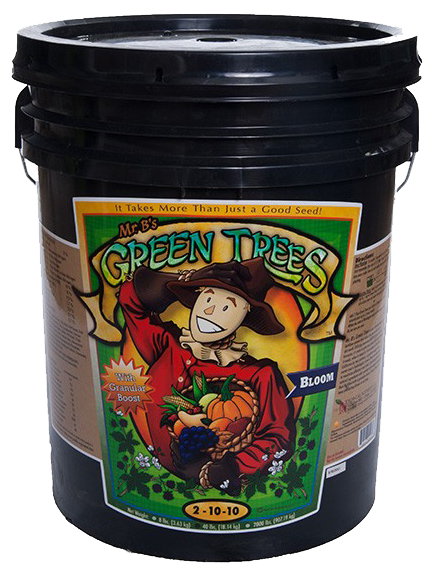 Mix 1 cup of Green Trees into every cubic foot of soil media that you till for new planting. Existing Plants: Apply to pre-moistened soil. Disperse up to 1 cup of Green Trees for every 10 Square feet of surface area and water thoroughly. Apply Weekly. 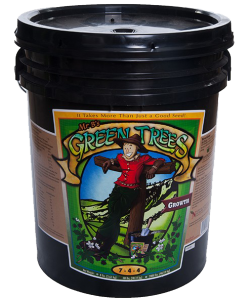 Add 2 Tbsp Green Trees per gallon of water and distribute around plant up to 3 times weekly. Derived From: Seabird Guano, Fish Meal, Kelp Meal, Bat Guano, Fish Bone Meal, Rock Phosphate, Blood Meal, Langbeinite,Ferrous Sulfate, Dolomite, Neem Meal, Sulfate of Potash, Oyster Shell, Feather Meal, Greensand, Volcanic Ash, Glacial Rock Dust. Mr. B’s All-Purpose; The simple solution. Our All Purpose 5-5-5 incorporates the best ingredients from our Growth and Bloom formulas including Guanos, meals and minerals. Address all the needs of a plant without emphasizing just one part of the cycle. May also be used as a transition between Growth and Bloom. Directions for Use New Planting: It couldn’t be easier to use Green Trees. Just remember the rule of 1:1. 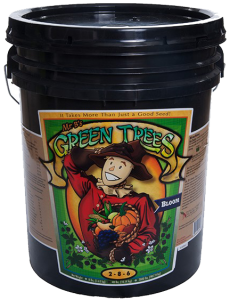 Mix 1 cup of Green Trees into every cubic foot of soil media that you till for new planting. Derived From: Seabird Guanos, Fish Meal, Kelp Meal, Bat Guano, Fish Bone Meal, Rock Phosphate, Blood Meal Langbeinite, Ferrous Sulfate, Dolomite, Neem Meal, Sulfate of Potash, Oyster Shell, Feather Meal, Greensand, Volcanic Ash, Glacial Rock Dust. The Ocean Provides for Mr. B’s Green Trees Bloom. Fortified with natural calcium, magnesium and sulfur sources including Langbeinite, Azomite, Oyster Shell and Greensand; micronutrients are in harmony with macronutrients to create the ideal blooming feed. Derived From: Seabird Guano, Kelp Meal, Bat Guano, Fish Bone Meal, Rock Phosphate, Blood Meal, Langbeinite, Ferrous Sulfate, Dolomite, Neem Meal, Sulfate of Potash, Oyster Shell, Greensand, Volcanic Ash, Glacial Rock Dust. For growers looking to push the boundaries for the highest yields possible. Our Granular Boost Line builds on the natural formulas and adds a conventional fertilizer boost. 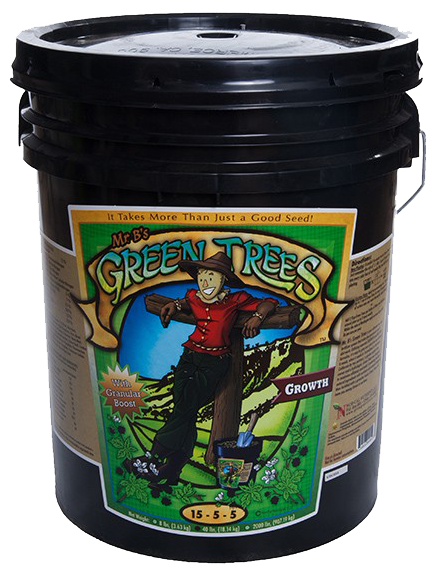 Mr. B’s Green Trees Growth with Granular Boost. Utilizes the base formula of our Growth product and rockets it to the next level with the addition of a Urea, Triple 15 and Triple Superphosphate fertilizer boost. Derived From: Seabird Guano, Fish Meal, Kelp Meal, Bat Guano, Fish Bone Meal, Rock Phosphate, Urea, Blood Meal, Langbeinite, Ferrous Sulfate, Dolomite, Neem Meal, Sulfate of Potash, Triple Superphosphate, Oyster Shell, Feather Meal, Ammonium Nitrate, Calcium Phosphate, Diammonium Phosphate, Monoammonium Phosphate, Potassium Sulfate, Greensand, Volcanic Ash, Glacial Rock Dust. Mr. B’s All-Purpose with Granular Boost. For those farmers who feel like 2 steps is just one too many! Like the 5-5-5, except for All Purpose 8-8-8 blend incorporates a synthetic boost of conventional fertilizers to the best ingredients from our Growth and Bloom formulas. All needs of a plant are addressed without emphasizing just one part of the cycle. Mr. B’s Green Trees Bloom with Granular Boost. Utilizes the base formula of our Bloom product and propels it to the next level with a Urea, Triple 15 and Triple Superphosphate Boost. Fortified with natural calcium, magnesium and sulfur sources including Langbeinite, Azomite, Oyster Shell and Greensand, creating the ideal blooming feed. Introducing Mr. B’s Green Trees Azospirillum Super Concentrate! Bringing you the quality you have come to expect from the Mr. B’s Green Trees product line, our new Super Concentrate provides over 215x the Azospirillum concentration per volume of leading brands products. 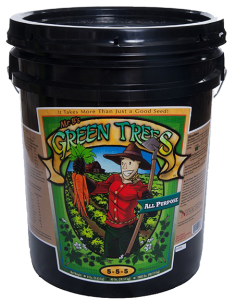 For planting, transplants, rooting, reservoirs or root drench, it’s all 1 Tablespoon/gallon. With the addition of Seaweed concentrate, this product will amplify your rooting and growth potential beyond your expectations. Available in 1 lb, 3 lb and 10 lb sizes. New planting, transplanting, propagation machines, root drench, reservoirs, any vegetative plant…. New products in the works for 2018!